The Delsea Drive-In movie theater, in Vineland, New Jersey, is an open-air theater with a full menu restaurant showing movies in a vintage environment with modern technology. Families will enjoy staying for a full double feature. The Delsea Drive-In is the first and only drive-in movie theater in the state of New Jersey. It originally opened in 1949, where it operated until 1987. After decades of being closed, it was reopened in 2004. 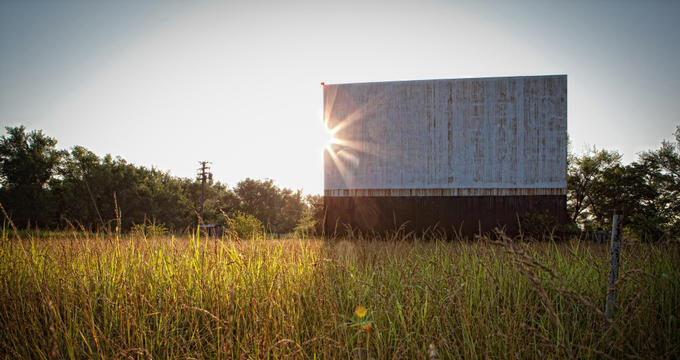 There are currently less than 400 drive-in theaters still in operation in the United States (a number which has greatly fallen since its invention in 1933, where there were over four thousand). The majority of the money made by the drive-in comes from their on-site restaurant. The Delsea continues to want to make improvements to both their site and their screens so that they can continue to offer movies for many years to come. The main attraction at the Delsea Drive-In, besides the amazing, retro facility itself, is bringing the whole family to see a movie without having to leave the safety of the car. Prior to being allowed access to the theater, the drive-in’s staff must screen all cars. This includes having all trunks and hatches inspected to make sure no one attempts to sneak in without paying an admission fee. Guests who arrive at the drive-in after the movie feature has started are asked to enter the grounds with only their parking lights on so as not to disturb other patrons already enjoying the movie. Those cars should enter the drive-in and head immediately to the right and park starting at the very back three rows (on screen one) or the back row (on screen two). During intermission, cars can choose to move to a closer viewing position. No pets will be allowed on the grounds unless there is a special event. Exceptions will be made for service animals with the appropriate paperwork. Guests may not bring alcohol. Smoking is only permitted in specific parking spots, marked with red poles. No cars are allowed to be running during the movie, with the exception of momentarily turning them on in order to save the battery. This is for the enjoyment of the other movie patrons as well as protection of the environment. The Delsea shows movies that are mostly rated either PG (parental guidance recommended) or PG-13 (parental guidance strongly recommended). Occasionally, G rated movies (those acceptable for guests of all ages) will be shown, as well as R rated movies (meant for guests over the age of 18 - identification will be checked). The cost of admission to the Delsea covers a double feature movie, essentially allowing two movies for the price of one. However, guests are not permitted to switch screens between movies without purchasing an additional ticket. Visit the “now playing” section of the website to see what movies are currently playing, as well as to see any upcoming movies. The box office for the drive-in opens around 6:45pm and movies will start around dusk. The Delsea holds a variety of special events throughout the year. These are updated on the theater’s website on a regular basis. One of the favorite categories of special, drive-in related events are their frequently offered “classics” nights, where the drive-in plays old, favorite classic movies. The drive-in will also offer Pet Sundays during the year, allowing guests to bring their dogs. Pets must all be on a short leash (considered less than six feet in length) and guests must pick up after their dogs. Dogs will not be allowed to urinate on the drive-in posts and cannot enter the concession area or the human restrooms. There are also other occasional special events hosted at the Delsea, like the classic car show that is offered annually in August. These events are all updated on the drive-in’s website. The Delsea is also available for rent on days that it is not in operation and showing movies. Contact the staff for additional information about renting. The Delsea offers a full menu and restaurant experience for hungry drive-in guests. Visitors can enjoy specialties like stir-fried asparagus, jumbo beef hot dogs, hamburgers, and pizza either by the slice or by the entire pie. There is also a large gluten free menu, as well as a few Atkins offerings. Desserts are offered as well. The concession stand also sells a few collectibles, like t-shirts, yo-yo lights, and glow bracelets.